Members gaz832, Itachier, shadowtief, trk94 have reported a problem on this file. It's not A4 or A3. It's not adjustable to be printed in just one page (or even in 2 A4) Please, retouch de file so we can print it on real A3 :) Thanks! dadoulesage, Itachier, KikeBv, LordofTheNords, MarkyUppy and 1 other members asked a retouch for this file. Members Menic, silva de andrade, sonrisa29 asked a new scan for this file. Anyone could make an A3 version of this? En A4 c'est impeccable, MERCI ! ! ! Just paste both images on a 4000x4000 300dpi PSD file, and the size should be good. 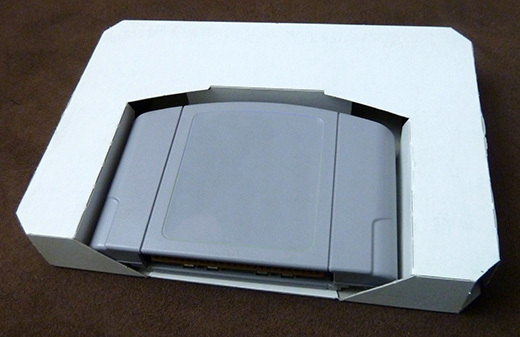 Trop petit et flotte dans la boite, pourtant imprimé a la même échelle qu'une boite N64 (300dpi).